With its fleet of 4 engines, 2 water tenders, 3 rescue trucks, 2 rescue boats and 2 jet skis, the Mendocino Volunteer Fire Department stands ready to respond to fires, cliff and ocean rescues, medical emergencies, and to extend aid to neighboring counties and districts. In existence for 125 years, it continues to rely on community support to provide excellent fire and rescue services. 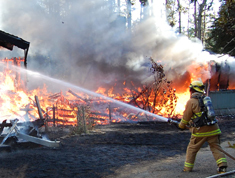 Our Department consists of 34 volunteer fire fighters who are ready to tackle any fire emergency. Their training is rigorous, and they are on call 24/7. Read more. . .
Each of the Department’s meticu-lously maintained engines is equip-ped and detailed for a specific function. Read more. . . 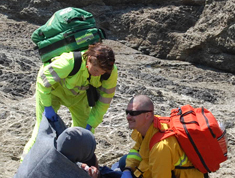 The variety of rescues handled by our trained volunteers include cliff rescue, ocean rescue, earthquake rescue and the occasional animal rescue. Read more. . . 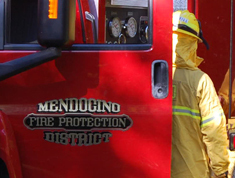 In Mendocino County, your call to 911 is answered at the Mendocino County Sheriff's office, where it is routed to the appropriate community and agency in charge of first response. MVFD keeps a record of calls routed to them, and a weekly report may be downloaded here.